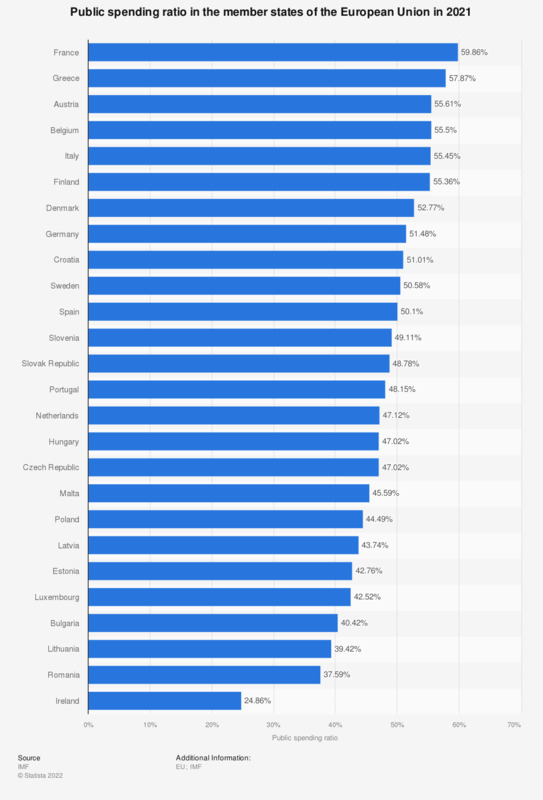 This statistic shows the public spending ratio in the member states of the European Union in 2017. All figures are estimates. The public spending ratio is the ratio of state expenditures to the gross domestic product (GDP). In 2017, Belgium's estimated public spending ratio amounted to about 52.2 percent of the GDP. What does the European Union mean to you nowadays? Thinking about Sweden's relationship with the EU, which of the following statements best reflects your view? Thinking about Norway's relationship with the EU, which of the following statements best reflects your view? Thinking about Denmark's relationship with the EU, which of the following statements best reflects your view?